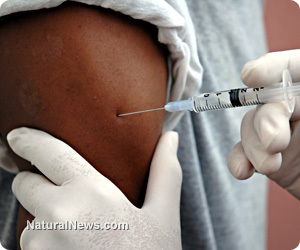 (NaturalNews) It has been on the U.S. drug market since the early 1990s, and population control organizations like Planned Parenthood continue to push it heavily on black women and other ethnic minorities as a form of contraception. But the injectable contraceptive drug Depo-Provera, manufactured by Pfizer, has an extensive track record of causing serious harm to women, including its tendency to trigger the development of cancer. Most people are unaware of this and many of the other long-term side effects of Depo-Provera, because eugenics groups like Planned Parenthood erroneously claim the drug is "safe, effective and convenient." But the non-profit Rebecca Project for Human Rights (RPHR) recently issued a groundbreaking report outlining the adverse effects of this insidious birth control shot, which currently bears a "black box warning" issued by the U.S. Food and Drug Administration (FDA) back in 2004. This warning clearly states that women who receive Depo-Provera could develop significant and irreversible bone mineral density loss, for instance. The drug can also lead to blood clots in arms, legs, lungs and eyes and may also cause stroke, bleeding irregularities, weight gain, ectopic pregnancy and delayed return to fertility. In some cases, women who get jabbed with Depo-Provera become permanently sterile. Perhaps most concerning is the fact that Depo-Provera has been shown to more than double a woman's risk of developing breast cancer. A 2012 study out of the Fred Hutchinson Cancer Research Center in Seattle found that, compared to women who had never received a Depo-Provera shot, jabbed women were about 220 percent more likely to develop the disease, regardless of their family and medical histories. But according to RPHR, none of these catastrophic risk factors has deterred groups like the Bill & Melinda Gates Foundation, the United States Agency for International Development (USAID), Columbia University and others from aggressively pushing this horrific jab on unsuspecting women both domestically and abroad. The group's report draws attention to the fact that these organizations have committed medical violence against women, particularly in third-world countries, by administering the shot time and time again without informed consent. "The story of Rebecca Project for Human Right's struggle to unmask Depo Provera as a deadly contraceptive for women is important, because it demonstrates the deeply rooted cultural hegemony of population control and corporate profits put before humanity at any cost," explains the report, entitled Depo-Provera: Deadly Reproductive Violence Against Women. It goes on to highlight numerous Depo-Provera experiments that have taken place against women in the U.S., Ghana and elsewhere. Though many foreign governments have since outlawed medical experimentation on women with Depo-Provera, the U.S. continues to embrace the drug, as well as distribute it to overseas health contractors, according to Turtle Bay and Beyond. And the Gates Foundation and others continue to invest hundreds of millions of dollars into the distribution of Depo-Provera across the globe. "The Rebecca Project for Human Rights urges the U.S. government to enforce mandatory FDA Black Box patient counseling requirements, and for health providers to obtain valid informed consent before Depo-Provera is administered in the United States, Africa, the Caribbean, Latin America, Southern Asia and the rest of USAID's program areas," concludes RPHR.